Virtual Reality, Cheap! Johnny is back with more Wii hacks. This time, he uses the Wii infrared camera (Wii Remote) to perform head tracking (using 2 Infrared LEDs or the Nintendo Sensor Bar). 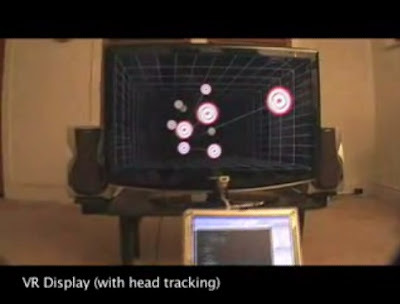 Basically, this allows him to use the data for positioning the viewer's head in space (by solving the triangle) and move the displayed data around to emulate a 3D display.